July 03, 2003, LG Crabo & EK Crabo. 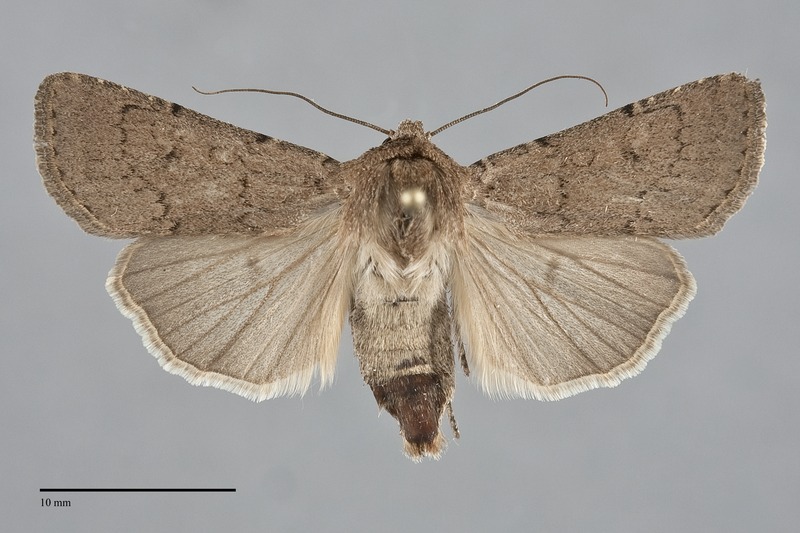 Euxoa permixta is an uncommon medium-sized Euxoa (FW length 14–17 mm) with a smooth light brown-gray forewing with thin black transverse lines, outlines of the spots, and a black line across the collar that flies in dry forests during the summer. The forewing is nearly even medium-dark gray-brown, minimally lighter in the terminal area and barely darker in the distal subterminal area. The basal, antemedial, and postmedial lines are black, double on the costa and single elsewhere, often faint or absent. When visible, the basal and antemedial lines are slightly irregular and oriented transveresely across the wing. The medial line is absent. The postmedial line is weakly toothed, drawn sharply toward the base on the costa, angled toward the base and S-shaped elsewhere, slightly convex opposite the cell and concave below the reniform spot. The subterminal line is a barely-evident transition in shade between the subterminal and terminal areas. A row of black spots comprises the terminal line. The orbicular and reniform spots are incompletly outlined by very thin black lines and are filled with the ground color. The orbicular spot is small, round or oval. The reniform spot is kidney-shaped. No trace of the claviform spot is evident. The hindiwng is medium-dark tan-gray, slightly darker gray toward the margin, with slightly darker veins, discal spot, and terminal line. The fringe is white with a two toned ochre and gray base. The head and thorax match the forewing. A frontal tubercle is present. The male antenna is strongly biserrate with long fasciculations. Euxoa permixta is placed in the subgenus Euxoa. This species can usually be recognized by its even gray-brown forewing with thin black lines and partially-outlined small spots. It is only likely to be confused with some forms of Euxoa infausta, a common and widespread species, and Euxoa bifasciata, an extremely rare Euxoa. Compared to E. permixta, the forewing of Euxoa infausta has a larger oval orbicular spot that usually has a darker center and its pattern is more complex. Euxoa bifasciata lacks the black line across the collar that is a feature of E. permixta and E. infausta. This species is widely distributed in dry forests, but appears to be rare and sporadic. In the Pacific Northwest, it flies in dry open ponderosa or lodgepole pine forests and appears to be most frequent in the former. It is common in a few places, including in the Entiat Range in Chelan County, Washington. Euxoa permixta is found along the east slope of the Cascades south of central Washington and in the Ochoco and Blue Mountains of eastern Oregon and southwestern Washington. The range of this species extends south from our region to New Mexico, Utah, Nevada, and southern California. A disjunct population is found in western Nebraska and the Black Hills of South Dakota. 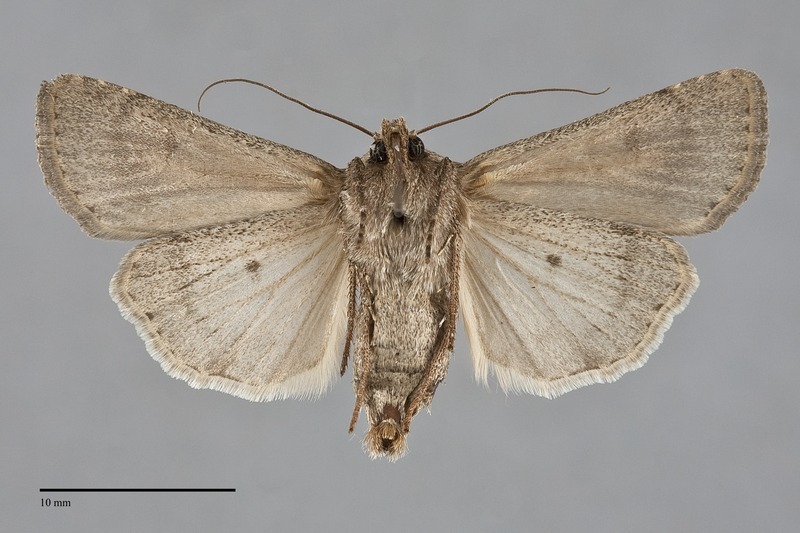 No information is presently available regarding larval foodplants of this species, but it is probably a soil-surface feeding cutworm that feeds on herbaceous vegetation. This species flies during the summer. Records from our region are from mid-June to early August. It is nocturnal and comes to lights.